Capitalizing on its management team's historic strenghts and indepth knowledge, KISPL Coal Trading Division offers a full line of energy products and services. Our service offers collaborative planning, forecasting and replenishment (CPFR) to bring speed, accuracy, and simplicity to demand planning to you; thus enabling you to increase revenue, organizational agility, and customer service by maintaining the right inventory levels for demand peaks and valleys. Accurate forecasting of resource requirements will improve profitability. Spontaneous combustion The generation of heat in bulk coal, leading to fire if uncontrolled, occurring as a result of coal and/or iron sulphide oxidation. 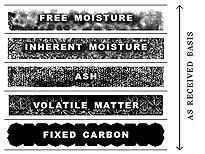 Lower rank coals in general are more susceptible to spontaneous combustion. Laboratory tests and procedures can give a good indication of the propensity to self heat, but the only sure way is to conduct tests on large stockpiles of several thousand tonnes. A common laboratory test is determining the crossing point temperature or ignition temperature, in which coal is heated in an oxygen atmosphere.